In the scientific domain, our main purpose is to facilitate the mutual exchange of information between scientific institutions in both countries, whilst promoting joint participation in the research of projects and the mobility of scientists between both countries. Since 2015, the Spanish Foundation for Science and Technology (Fundación Española para la Ciencia y la Tecnología, FECYT) has appointed a scientific coordinator to this Embassy to embed more science into our foreign policy, to reinforce Spanish science diplomacy, to establish collaborations with British science stakeholders, to support the internationalization of the Spanish system of science and technology, and to provide support to Spanish scientists in the UK. 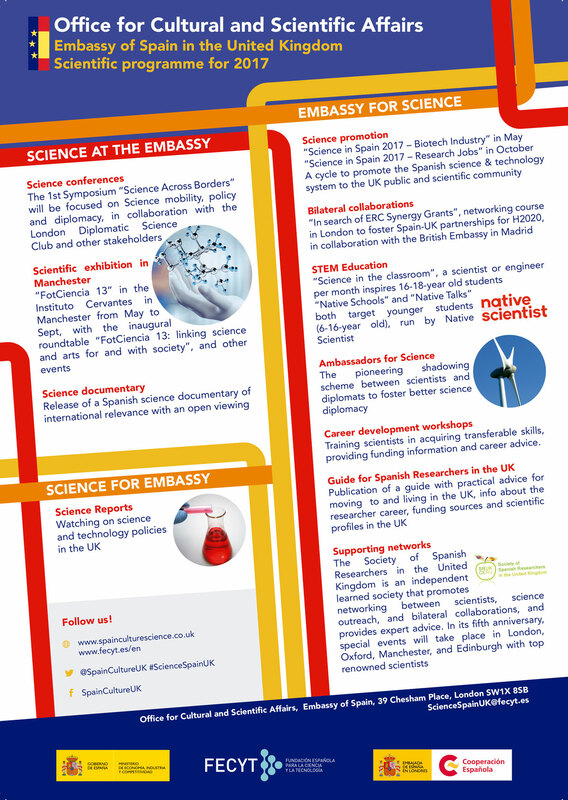 If you need any further information about any of our events, please contact our scientific coordinator at ScienceSpainUK@fecyt.es. Click here to download the programme of scientific activities 2017.